Remember before we had Facebook, there was Myspace? Don't lie. Yes you do remember! Tom was everyone's friend, and sometimes he was even in the top friends list! But Myspace ended up disappearing. Well, not entirely. It's still there. But it's more for music now. Also, recently the internet lost Vine. There are many many social media platforms out there and I'm sure all of us are on at least 3 of them. Do you know what they all have in common? The next big thing can and will come along, and replace them. If you have a significant amount of followers that enjoy your content, you would loose them. What is the one thing that will not go away? Email. Yahoo, Gmail, Outlook. They will still be there when the Myspace's and Vines of the internet go away. If that isn't the biggest reason enough to start building an email list, here are 3 other reasons why it is a vital tool in any business. At the time of writing this post, it is the holiday season. Every business, small and corporate, is trying to come up with creative was to get their holiday promotions seen on social media. And even forking out money to boost their posts in hopes of bringing their holiday cheer into the homes of families looking for the next big toy for their little girls and boys. I'm so sorry. That all just kept rolling out of my head onto the screen and I just went with it. But its true. Social media is a competition to be seen. With email, you are seen. You are in the inbox. You aren't competing with newsfeeds, non sense comments from people complaining just because they are bored. If you have a product or service that you offer, offer it through email marketing. Clients or customers open your email and read only that. They aren't distracted by everything else. It's just you and them. People do business with people they know, like, and trust. Email gives you the ability to build credibility with your audience by sharing helpful and informative content. If you are a photographer, once a month you can send out newsletters giving your clients tips and advice when it comes to photo sessions. Like this one here that I wrote about How to Prepare For Your Winter Family Photo Session. Sharing tips and advice shows you know what you are talking about. It shows authority. And when you know what you are talking about, people grow to know, like and trust you. While social media posts are getting more versatile with the way we can post, like with GIFs! I love gifs! Maybe a bit too much because I could have a whole conversation with my friends using gifs! but see, that's just it. It's not very..professional. While I am all about adding personality to anything you put out there, as a business, your brand still needs to show professionalism. With email marketing services, they provide templates that you can use, or if your really good at graphic design, you can make your own templates. There are tons of email marketing services out there to choose from. And it can get overwhelming. I started out using Mailchimp, but ended up leaving them. Everyone has a personal preference for everything. Once I found Mailerlite, I hit full speed and never looked back. I LOVE Mailerlite. Forever. They are so easy to use and setup! The best part, they are completely free up to 1,000 subscribers!!! Use my link to go check them out! If you do sign up through my link, we each get a $20 credit towards our accounts to use when we do reach 1,000 subscribers! Just click here! 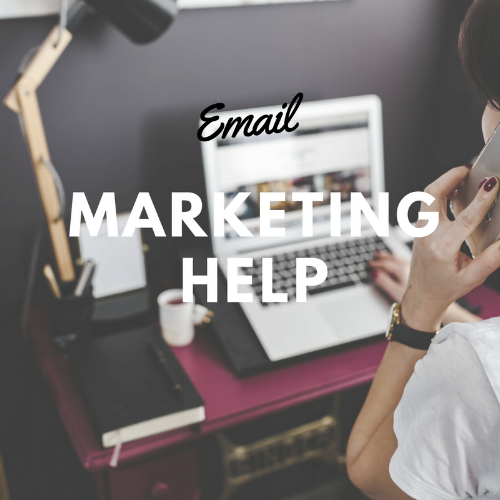 Get The Email Marketing Guide For Photographers HERE!